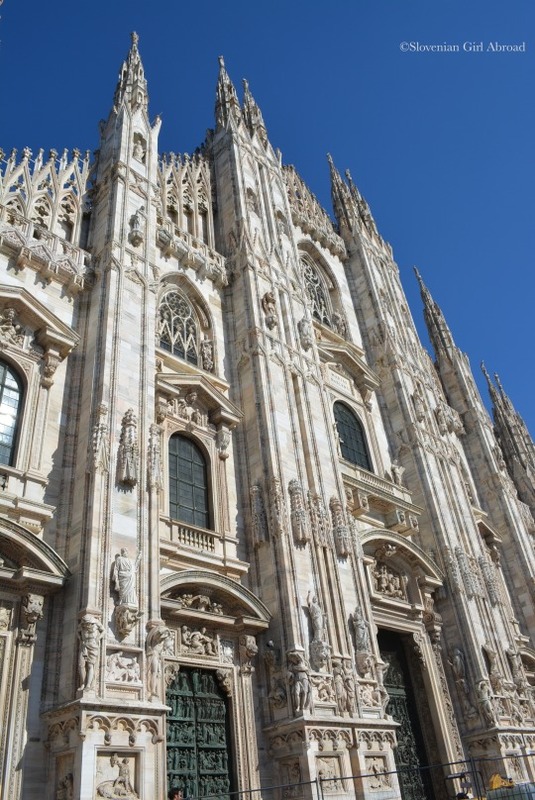 The Duomo is located on the main square of Milan, at a site that has been the most central location in the city since its founding. 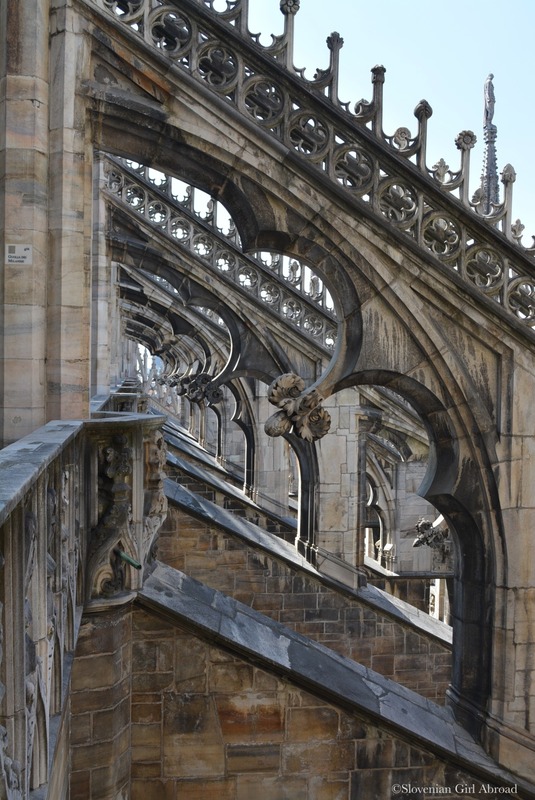 The church is world’s largest Gothic cathedral with the estimated capacity of 40,000 people. Its building began in 1386 on the site of basilicas Santa Tecla and Santa Maria Maggiore which were destroyed in the fire. Although being consecrated in 1418, its construction continued until 1813 when it was completed. Well, officially completed. The last final finishes were being applied in the following decades. In fact, the work on cathedral never really finished. Even today, there are construction workers renovating some parts of the church. 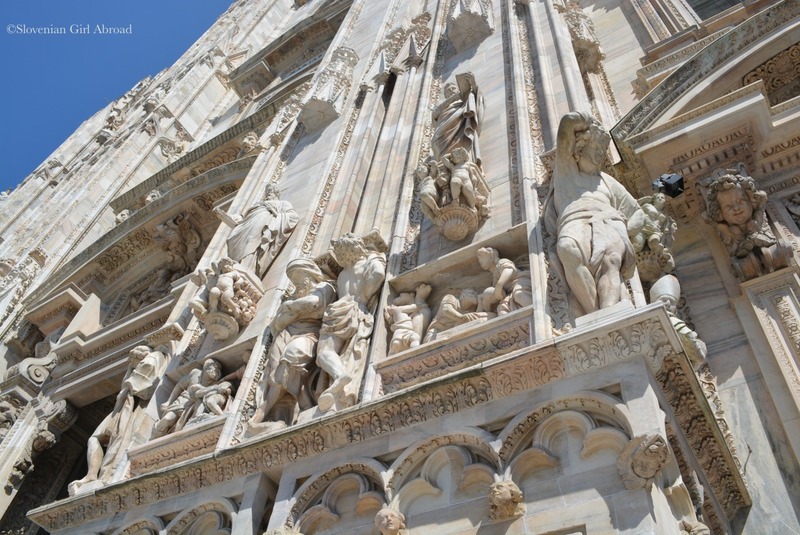 Duomo’s marble facade is a masterpiece. Over the years of built, master builders changed and the initial design was altered to become even more spectacular. 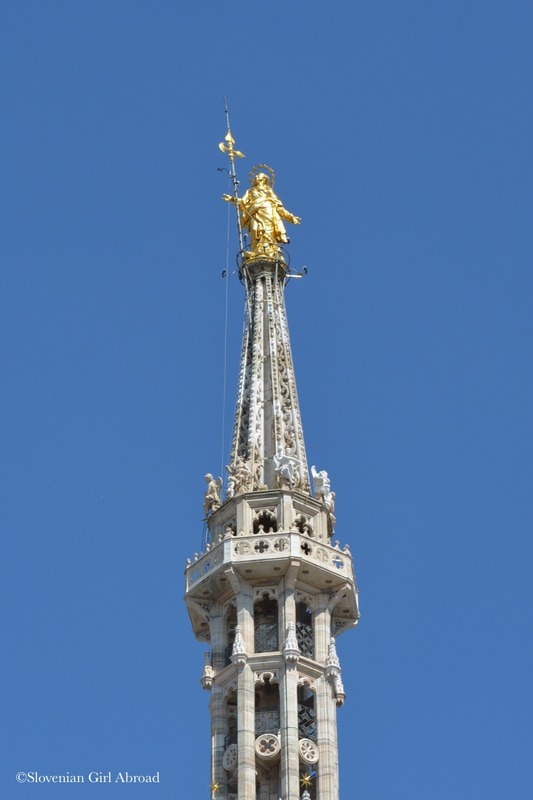 The Duomo’s roof has 135 spires and 3200 statues, including the cooper statue of virgin Mary – “Madonnina”, to whom the Duomo is dedicated. To get a better view of them, you can climb the stairs (as I did) or take the elevator to the roof. The entrance is on the left side of the cathedral. 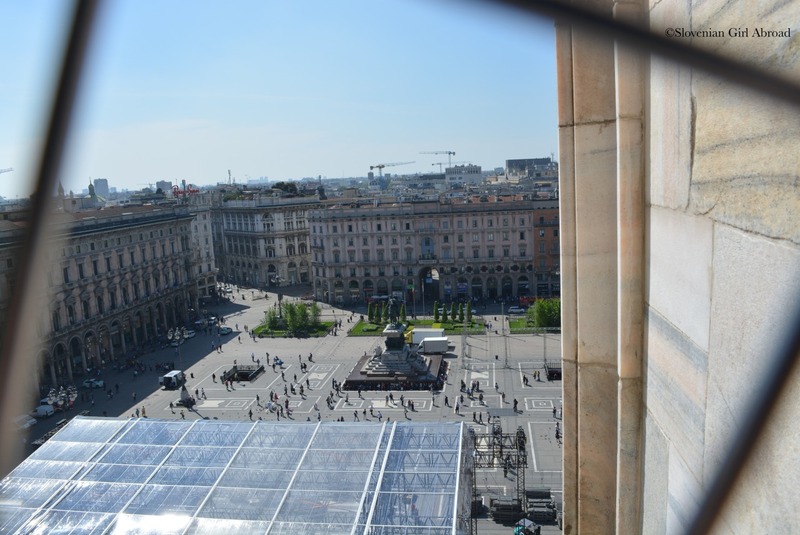 Walk on Duomo’s roof will only cost you 7 € (stairs) or 12 € (elevator). Do not miss it as it is a unique and memorable experience. 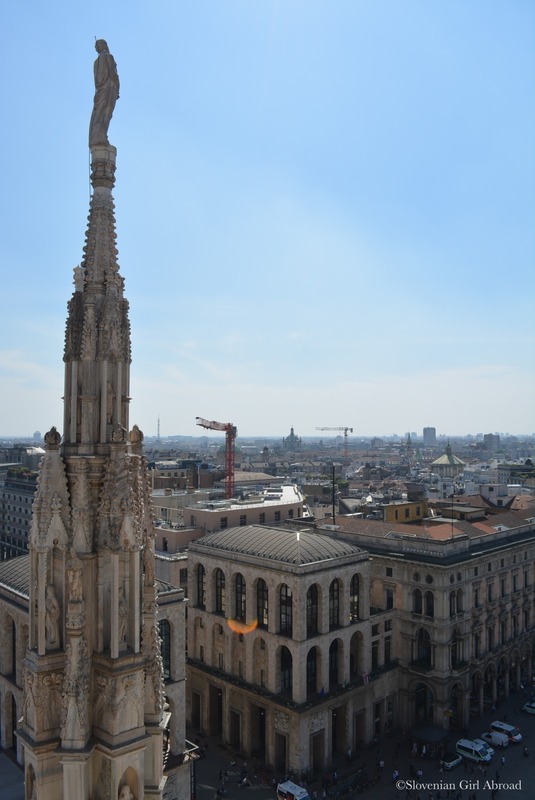 Apart from seeing the spires and statues up close, you can enjoy the fantastic views over Milan. The walk on roof is safe and is in my opinion also suitable for those afraid of heights. If you’ll take the stairs on a hot day, as I did on Wednesday, do not forget a bottle of water as it can get quite hot up there on the roof. Before entering the Duomo, make sure you’re properly dressed. No shorts, no short skirts, no bare chests, no bare arms. A girl dressed in tube top, in a queue front of me, was asked to cover up before entering the church. She did and was allowed to go in. Inside of the Duomo is quite dark and not terribly interesting. There are five large naves, divided by numerous pillars that supports the cross vaulted ceiling. Those and the altars, aisles and stained-glass windows are unfortunately not as impressive as the facade. The crypt can be entered from inside the cathedral near the choir. 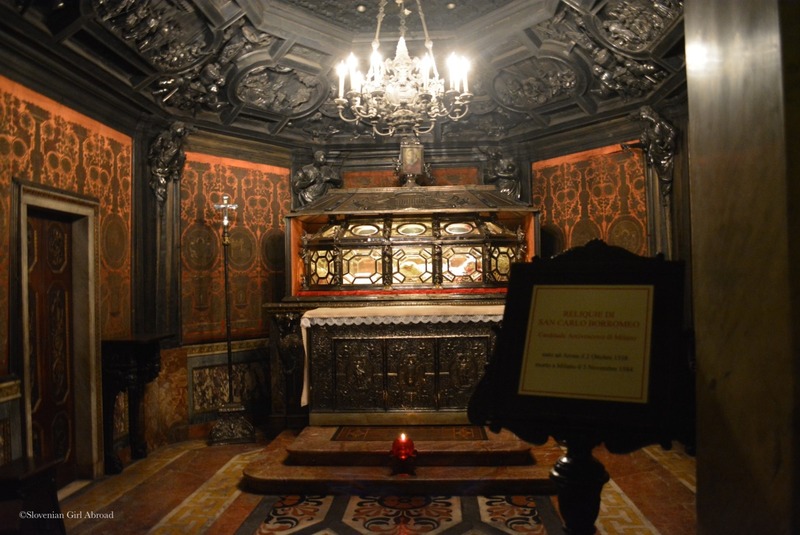 There you can see the Cathedral Treasury and the tomb of cardinal Borromeo, a bishop of Milan (1595-1631) and a founder of Biblioteca Ambrosiana. The entrance to the crypt is free. 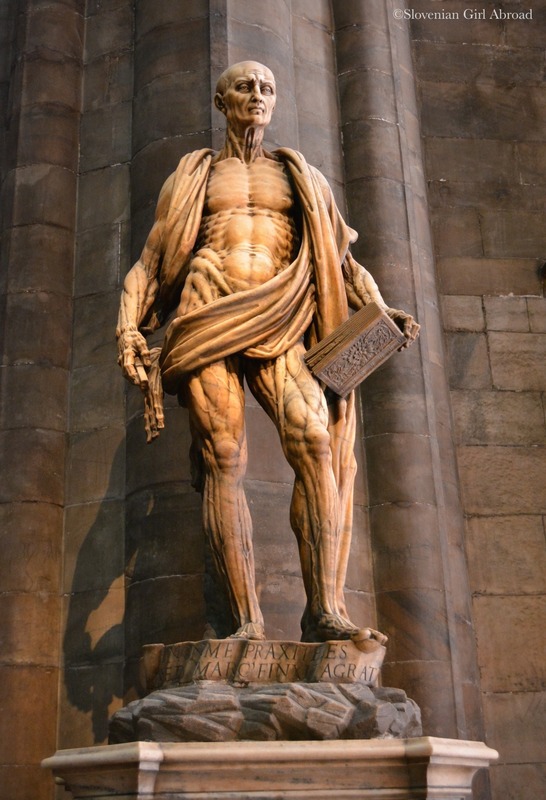 If you want to know more about the history of the cathdral, there are audio guides available. They can be rented in different languages for a fee of 5,50€. There is also a cheaper alternative – a simple interactive presentation for 2€. I haven’t try any of those, so I’m not able to make a comment about it. 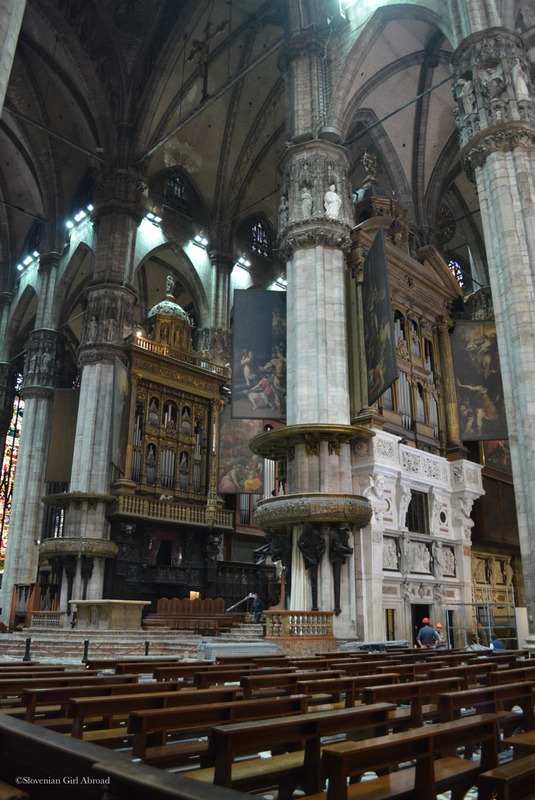 If you are ever in Milan, do not miss visiting this stunning cathedral. Climb to the roof and enjoy the views. 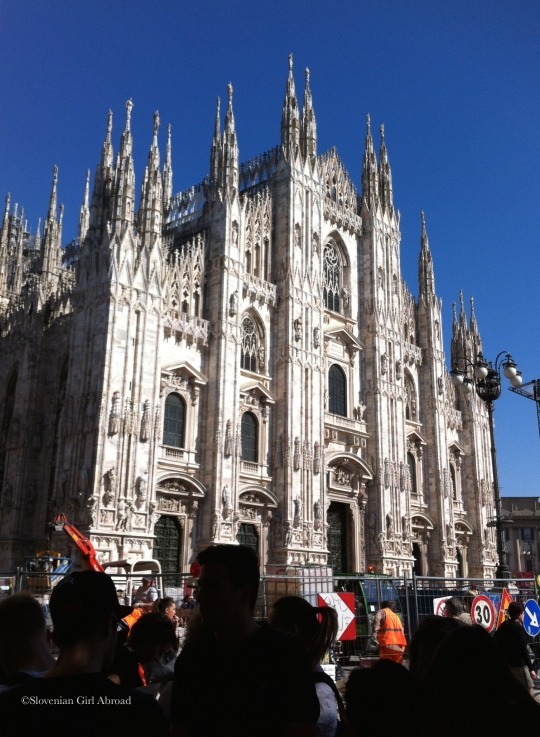 It is the most interesting experience, I’ve ever done in Milan. This cathedral is just so beautiful! I remember when I saw it the first time, i was blown away! You pictures of it are awesome! I agree! It is one of the most beautiful churches, I have ever visit. Beautiful building! Thanks for sharing. Honestly, I’m not big fan of Milan. I’ve been there many times and I still can’t fall for it. Though, there are some things I like about Milan: Duomo, shopping, football, delicious Italian cuisine and excellent gelato. If you get a good deal on flight tickets, I think it is a nice place for a weekend getaway. When you’ll visit I would love to hear your thoughts about the city! once upon a time …. that’s the way a fairy tale begins. But, I could say the same about my visit in Milan as a child: 1977! unbelievable! Thanks for reminding me to the inside. From the outside, the plaza and the scala I have some photos of my own. But, surprisingly not from the inside of the cathedral – and also no remembrance! There were plenty of pigeons on the plaza and many photographers selling bird food to the tourists to make photos of them with some pigeons on their hands. You have had to pay and later they sent the photos to the tourists home. We got 4. One for my grannie, one for my parents and 2 for me (my younger brother didn’t want one). Now, I have three of them. 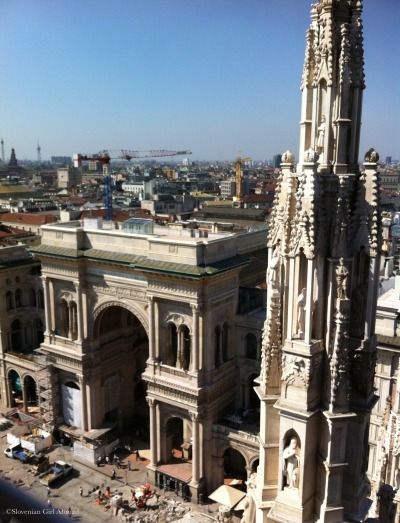 I haven’t been to Milan but after reading you post I will be sure to visit the Duomo if I find myself there sometime. The details of the architecture and the marble facade is amazing! Oh yes, both of those towns I want to visit! I decided this was my favourite building in the world – beating the Taj Mahal – as you can go on the roof. The splendour of walking alone the roof and seeing such detail close up is unbeatable. Gorgeous cathedral, and spires. That statue is very interesting looking indeed!